Last week an American march (Dragoon ride) designed to encourage NATO allies in the Baltic region ended with a cheerful arrival into Prague, capital of Czech Rep. American soldiers have been positively surprised. „I feel here like a star” – remarked one of them. Well, nobody thought it will look like this. Browsing the comments under European online newspapers (like Der Spiegel, FAZ, etc.) in facebook frequently shows an anti-American public opinion, even if we count out the Kremlin trolls. Extreme leftist, and some populist and right extremist politicians call for a Europe without American influence. Calls for a new order, less capitalistic and less ’liberal’ are increasing. It didn't use to be like so. For a while in the 90’s not just the US, but liberal democracy seemed to be once and for all victorious in the struggle for world power. The US achieved hegemony as the USSR dissolved itself, more quickly and peacefully than anyone could hope. From two conflicting worldviews and superpowers one vanished. Francis Fukuyama declared the victory of liberal democracy, like some new (and less careful) Hegel. Has the great conciliation (Versöhnung) arrived in history? Mankind’s struggle for recognition has finally ended? The honeymoon proved to be short. A terror attack of historical magnitude and a disastrous Middle East policy which followed changed the ’Zeitgeist’. 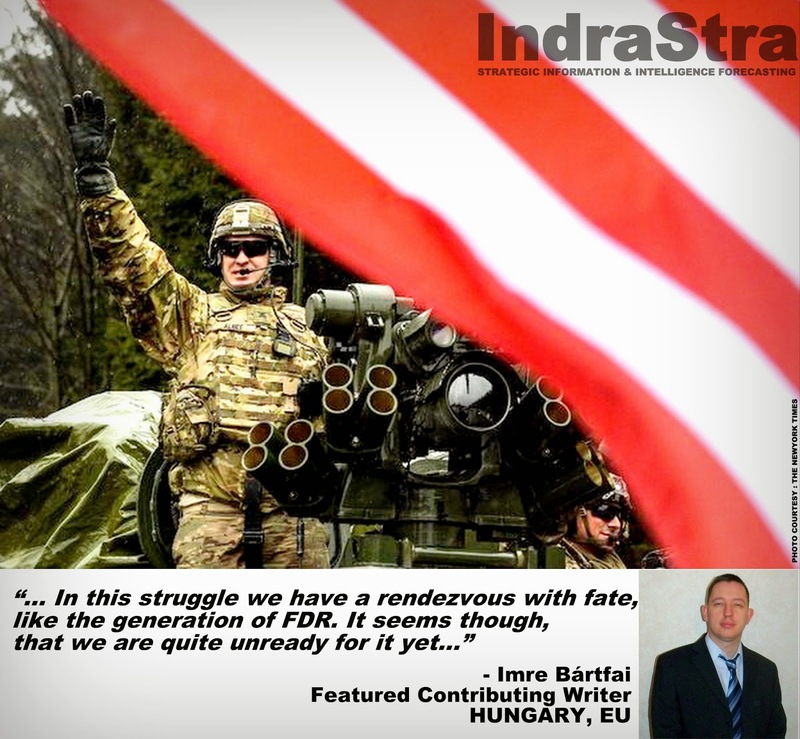 Europeans begun to consider US policy tyrannical and haughty, and US military presence superfluous. A new German-French cooperation provided a counterbalance to American influence. Growing anti-capitalist sentiment found one its targets in the arch-capitalist, consumer-spirited and militant America which we know from Michael Moore’s films. With the economical crisis in 2007 not just the global supremacy of the USA but the whole established consensus about capitalism, democracy and Western life became objects of scrutiny, or increasingly, strong, but often unskilled sarcasm. It is disturbing, how many people supports anti-American politicians and movements uncritically, with a zeal which reminds one to communist propaganda. People not only question the role of the USA in global politics, but question the very existence of European Union, NATO and even liberal democracy. How so? The rising threat of 'illiberal democracy” advances from multiple directions towards Europe. In the East, Russia’s leader, Vladimir Putin has used the chaos of the crumbling of Soviet empire (which Brezinski once said, could bury us under itself too) to create an authoritarian, super-nationalistic, propaganda-driven society, bent on revenge against imagined and real US. wrongdoings. Unlike the Soviets, Putin’s realm has no idealistic ideology about earthly salvation, and both the corruption and the oppression from which Russia suffers, are recurring problems rooting in the history of the area. Russia not only invaded Ukraine, occupied Crimea and supports Russian rebels in Ukraine, but threatens NATO almost on a weekly schedule. Popular opinion in Russia and leading ideologists (like Alexander Dhugin) alike support this militant and on the long run, ineffective policy. Putin, one of the richest person on earth, ruling over masses of poor, is just another czar in the disguise of a democratic leader, and he cultivates both the heritage of the glorious days of communism and the czars in an unlikely manner. This is the price for Russia’s lack of integration into the post-Soviet world order, which turned out to be no world order at all. The combination of aggressive nationalism with authoritarianism, politically motivated religion and social decay is the TNT of our times in Eastern Europe and Asia. In Turkey, where Asia meets Europe, the westernized development seems to have turned backwards. While Turkey’s economy is advancing well, its record of human rights is rather horrible. Recep Tayyip Erdogan rediscovered the Ottoman past with its warlike Islamist tradition, a heritage which the modernizing Atatürk-regime wanted to push into the dark rooms of the past, sentenced to silence. As usually, authoritarian tendencies awake political partisanship, sectarianism and violence, as it happened last week with a communist guerrilla attack on the ministry of justice. Turkey was accused of foul play, supporting ISIS against Kurds. In Hungary, which was once the eminent pupil of the West, populism, attempts to create an ’illiberal democracy’, corruption and an oligarchical government rule the day. Viktor Orbán, Hungary’s PM declared many times (most famously, in a speech in Tusnádfürdő, Romania) that he intends to build an ’illiberal’ (controlled) democracy, and a society which focuses on hard work and Christian values instead of welfare, and a liberal concern of Human rights. His party governs with a two-third in parliament, scarcely allowing any opposition proposal to succeed, uses state media for party propaganda, while drastically curtaining liberty and welfare. Mr. Orbán tries to keep Russians close while at the same time he both pleases and kicks the EU, by keeping Maastricht rules and criteria, and verbally attacking the European Union. This, and corruption cases brought on him US criticism, (and US entry bans for some corrupt party affiliates) which he answered with strong anti-American propaganda, declaring the principles of liberal democracy (like checks and balances) American and thus foreign inventions, superfluous in Europe. Greece seems to be also attracted to Russia, and Russian influence on the Balkans is considerable. It is very hard to be prophetic, especially about the future, but if a Republican government will move the shift of American foreign politics towards the Middle East, neglecting Europe, and if they will escalate the Israel-Iran problem in that region, we will face bleak prospects of future. A hawkish pro-Israel policy will provide no results,and it could push the leaders of Iran towards more anti-western action and propaganda thereby destroying the last hopes of younger, more open generations. (And with it the possibility of a slow, but promising change unlike the swift, but problematic ’Arab spring’.) The USA cannot handle two crises at once, and there is already one in Europe. New American failures in global politics would bring a more hostile environment for Western politics, and as a consequence, America could acquire an urge towards an imagined ’splendid isolation’. (Or even more failures...)With the USA absent from global crisis centres, chaos will be inevitable. While we all know thousand problems of liberal democracy, like being ineffective against inequality or against lowering citizen participation, anti-liberal forms of political order are even less effective in creating stability, welfare and liberty for society. Moreover, they are usually disastrous. They are no alternatives to liberal democracy, just as death is no alternative to sickness. Prosperity and social happiness relies absolutely on political freedom: no authoritarian state ever produced an affluent society like Norway or the USA in her heyday.Thus the task ahead seems to put up a staunch defense for Western values and democracy, in the hope of bettering them in the process. This fight will be inevitable and bitter, but gives us again a purpose: something to fight for, something which helps spiritual health and breeds fortitude. Western societies –in my opinion-are in a dire need of this purpose. As for anti-Americanism I think it is entirely irrational. While the global supremacy of the US was dangerous (remember: ambition must counteract ambition!) even for America herself, not every problem today can be traced back to American influence. Especially not problems of a degenerate mass culture, unregulated economy and failures of democratic liberty. Blaming US for everything is just another form of shaking off responsibility and applying generalized blame. Many countries today wouldn't even have the chance to choose any direction in foreign politics if the Western world hadn't won the Cold War. Criticism in every matter should be factual and not over-generalized, like blaming entire nations for the actions of one party. If we really want prosperity and peace, we must focus our attention to the rising threats against democracy. In this struggle we have a rendezvous with fate, like the generation of FDR. It seems though, that we are quite unready for it yet. Zbig. The Strategy and Statecraft of Zbigniew Brzezinski, edited by Charles Gati, John Hopkins University Press, 2013. ’Workfare society’- as Orban Viktor said.